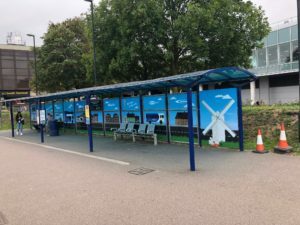 We set off for a site visit to take measurements and soon after receiving artwork Shay,Christa and Milo were busy producing the high impact graphics for the bus shelter’s. The excellent design has given passengers a more comfortable environment whist waiting for the buses to arrive. Well done to the Charles Rayner Ltd staff and lastly a thank you to Metrobus and Gatwick Airport for making this a enjoyable project!. Please contact Charles Rayner Ltd on 01908 565904 or email info@charlesraynerltd.co.uk if you have any enquires. PreviousPrevious post:Charles Rayner Ltd successfully completes a 3-year rebranding project!NextNext post:Charles Rayner Ltd had great pleasure in supplying and fitting the graphics for the Chiltern Railways Poppy appeal train!